Dixon Station Property: PVCF closed on our first property in Wellington on June 27, 2018. It is named Dixon Station after the nearby train stop that was used for loading sugar beets when the region was known for its many beet farms. Timeline and property history: This property was previously owned by the Denver Rescue Mission (DRM) and had been used as a transitional housing and training farm. Before that the farm had been a dairy and owned by the Beckstead and Tucker families for generations. Size: This property is 109 acres with 99 acres in grassland and hay and a 10 acre parcel with a house, old feed grain mill, old dairy milking barn and a variety of other outbuildings and infrastructure. Water: The property has 3 irrigation wells and 1 domestic well. These wells have good water quality and provide sufficient water volume to irrigate the property for most uses and in most water years. 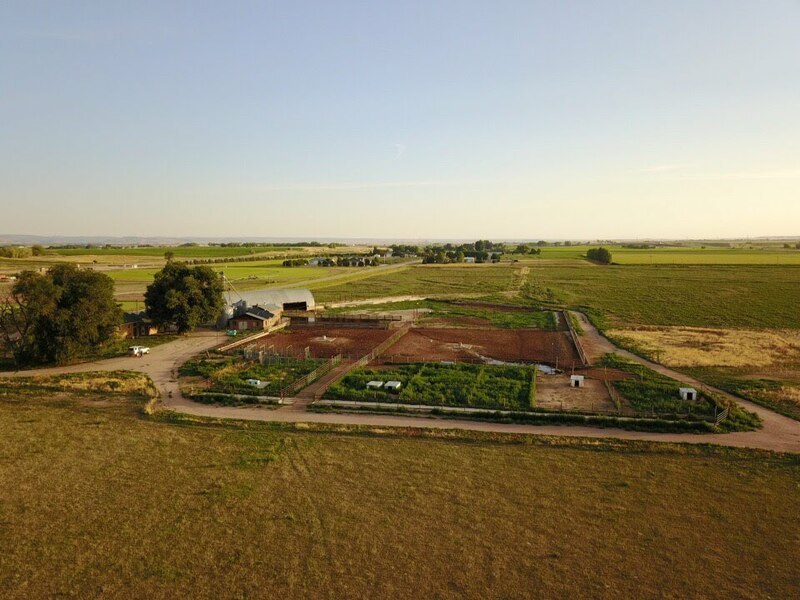 To provide additional water in dry years or to give PVCF flexibility, PVCF also owns two shares of North Poudre Irrigation Company water which provides additional volume and the option to rent surface water from entities like the City of Fort Collins. Current Producer: PVCF is thrilled to be partnering with Jodar Farms as the main producer on this property. As Jodar grows its own production onto these 99 acres, Jodar and PVCF will engage other small-scale producers who struggle to access grazing land in order to maximize the use of this property and allow them to grow their businesses. Learn about becoming a PVCF Coop member – become a household or investor member or contact us below with the contact form. Jodar Farms is a family-run farm owned by Aaron Rice that is dedicated to producing wholesome, nutrient-rich foods. Established in 2009, they believe in raising their animals with all natural growing practices and they strongly believe that animals should experience the things in life that make us all happy… warm sunshine, green grass and cool breezes. Along with producing healthy animals, they believe that people should know the whole truth about what they are eating. Complete records of where the animals came from, how they are raised and where they are processed are readily available. By keeping their CSA members informed, they believe they will be able to make better decisions about the food they feed their families. What they raise: Jodar focuses on Eggs, Pork and Chicken with the lamb and turkeys as specialty seasonal products. Jodar offers two main CSA seasons: Summer and Winter. The Summer CSA season starts in June and lasts until October. This is the only way to buy meat chickens from Jodar Farms. The Winter CSA starts in January and lasts until May. This is primarily designed for eggs, pork and beef (from another source neighbor). PVCF members will have first options to purchase CSA shares and any purchase from Jodar will contribute to member dividends once dividends are distributed.